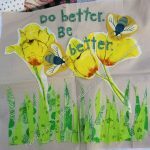 A couple of things came up at the guild meeting which I wanted to share. First, Another of the tops I made and donated was finished and shown. Cheryl finished the Stripes donation top that I made at QuiltCon last year. She gave me some nice compliments on it, which made me feel better about it. I may try that stripes technique without actually making the stripes. I know I can’t vary the stripes when I do’t make them myself, but making the stripes is super tedious. Peggy, as usual, was prolific in her quiltmaking. 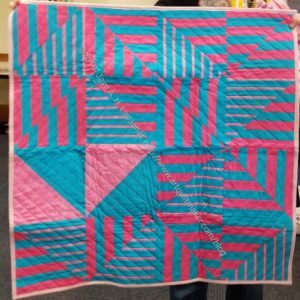 She made the above donation quilt from scraps she had saved generated by a previous pattern. 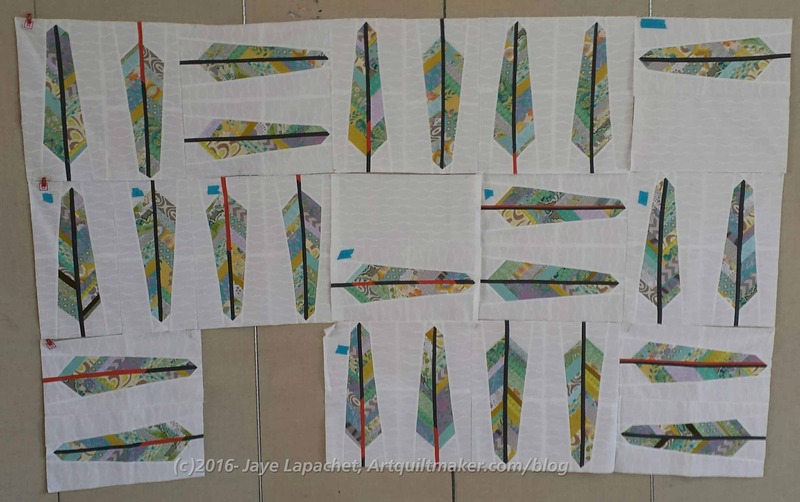 Each of the non-white triangles consist of made fabric. 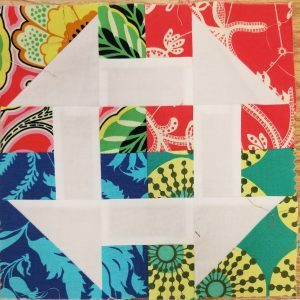 I think the randomness of the layout could be done with HSTs and would make a fun donation quilt. Once I am done with the Bias Rectangles, perhaps I will play around with this concept. Finally, we have a guild baby. His name is Sam and he is about a month old now. His mom, Velvet Pincushion, brought him and his grandma with her to the guild. The new little family will be moving soon, so we were thrilled to get a chance to meet him. 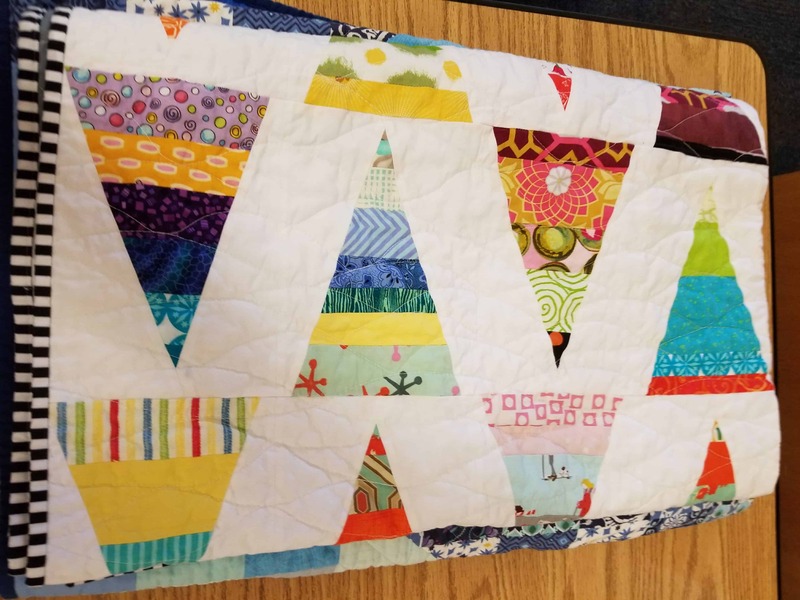 I am excited to see that VP is still stitching even with a new baby. 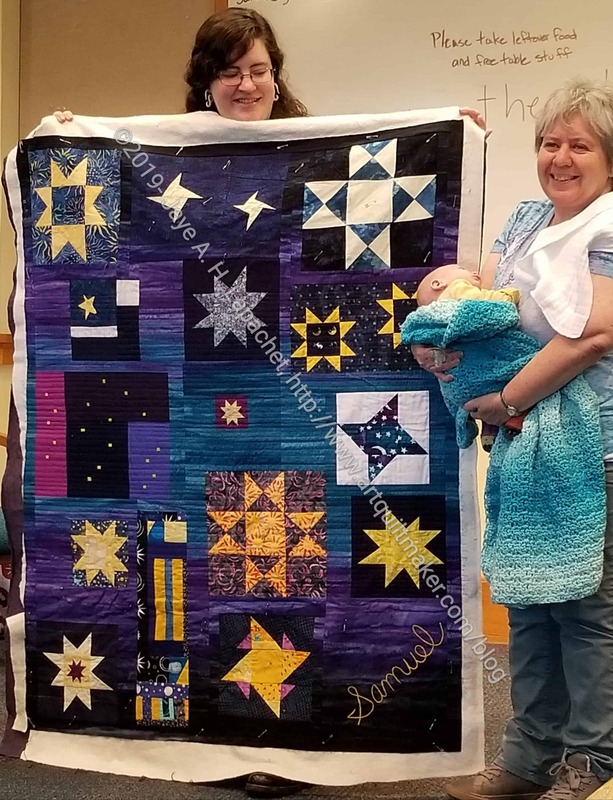 She brought the Color My Quilt quilt she worked on before Sam was born. Progress has halted, but she made good progress before Sam was born. I don’t know if we’ll see the quilt before they move. It is more block based than some of the others. My shard is on the bottom left in between the Friendship Star and the very bottom left hand star. Alison is really great. She always brings something to work on after the meeting. 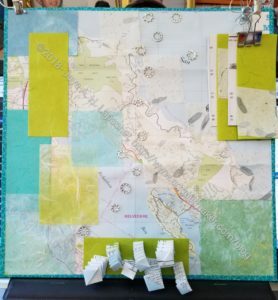 I have brought things in the past and I seriously thought about bringing the BAMaQG IRR quilt to stitch on. 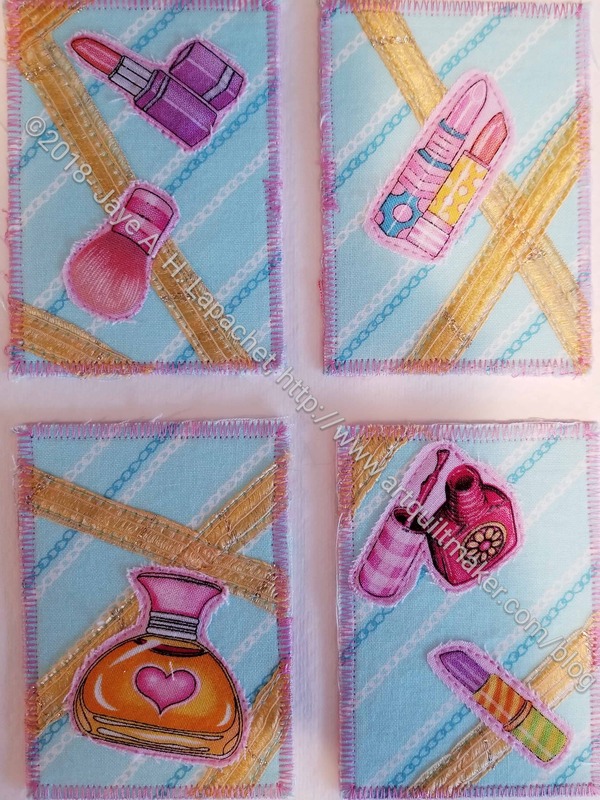 I think I need to try my hand at Big Stitch again at home before I start Big Stitching in public. This time she brought scraps. She brought them to sort out. I didn’t get to ask her how she normally stores them. What I saw was a big bag in which they were shoved. 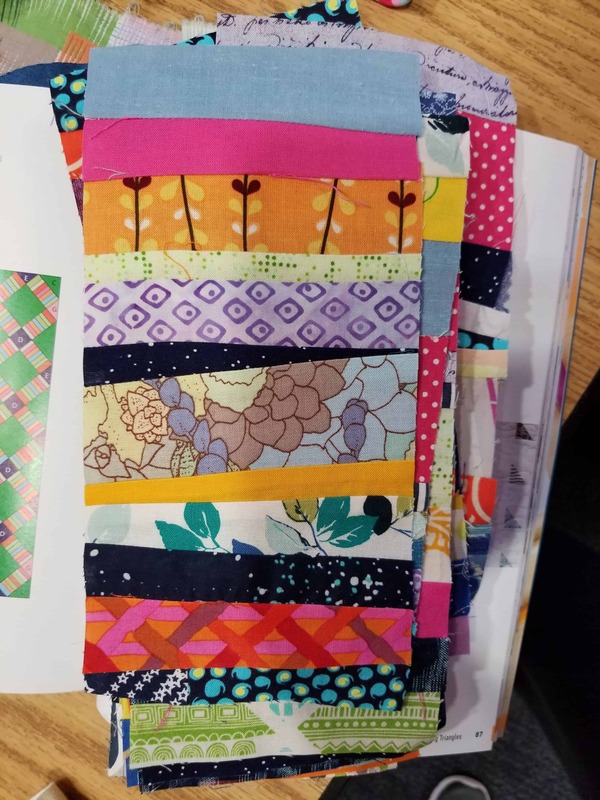 Alison was sorting scraps to make these 12/5 x 4.5 rectangles to make a quilt from a book called No Scrap Left Behind. She started out using a foundation (tracing paper), but found after a few blocks that she didn’t need it. This is definitely a block you make with what you have and then trim to the right size. I like how the sizes of the strips are different. Alison said that she doesn’t use any strips larger than 2.5″ wide and I think that makes sense. I like the skinny little strips as well. They add a bit of pop to the block. 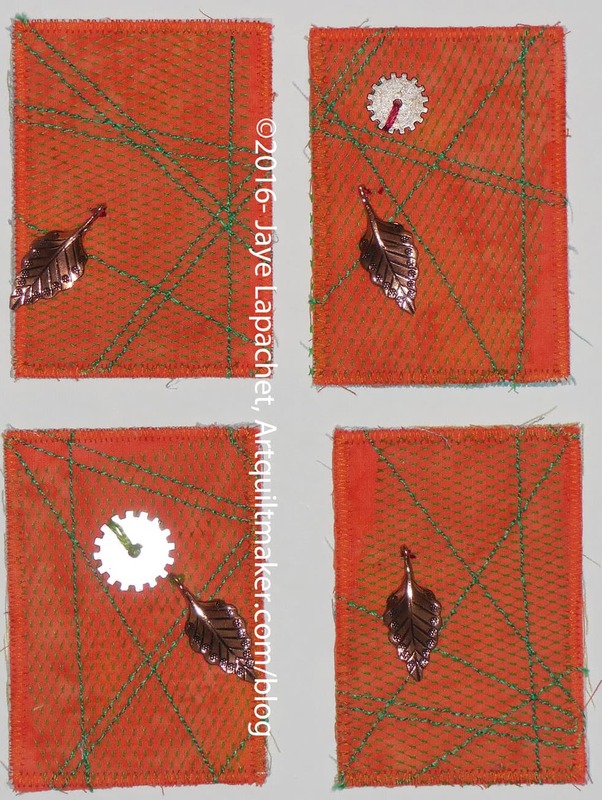 I am kind of excited to try this, not that I am done making the Bias Rectangles for more of the Spiky 16 patch quilts. This block sparked my interest. I have a ton of scraps. I do use them, but the piles are not getting any smaller. 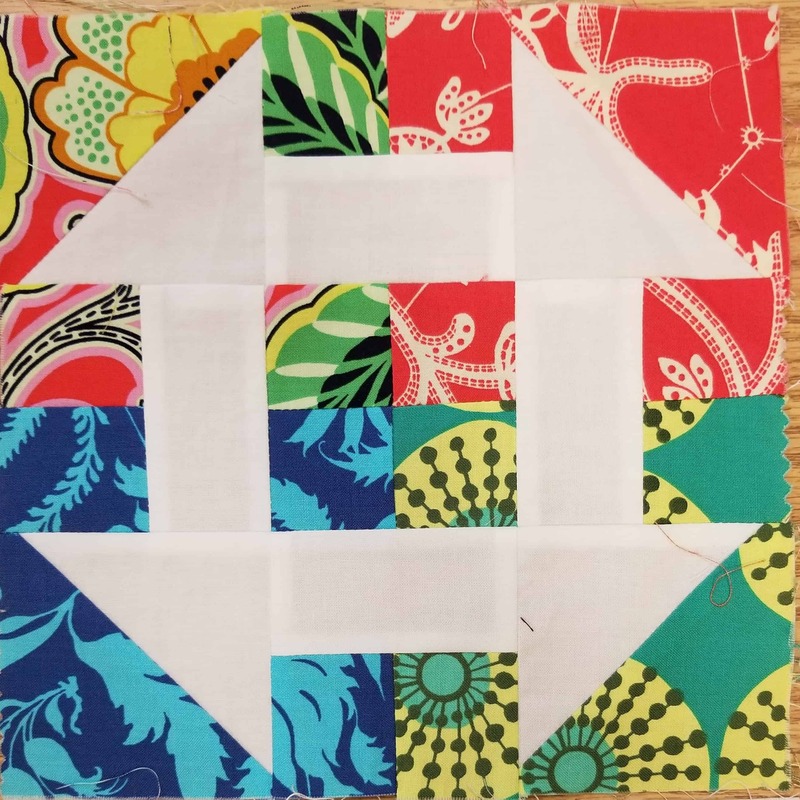 This block would enable me to use different scraps together. 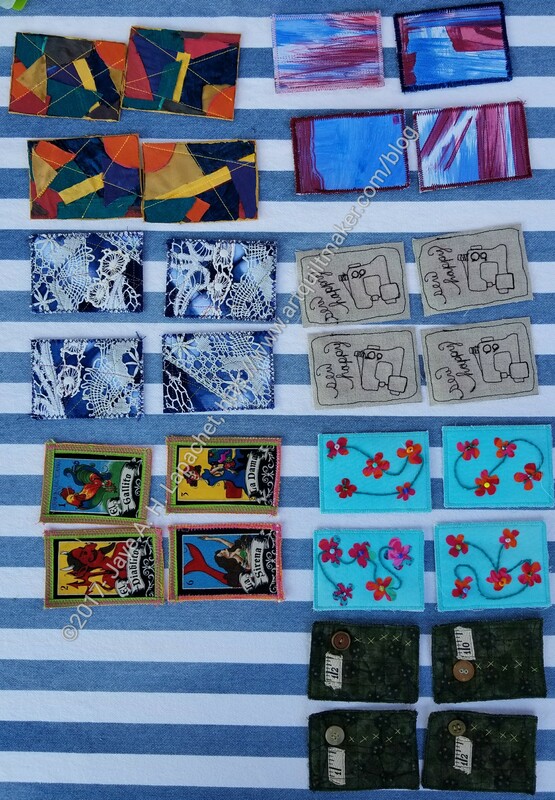 Once finished, I could put the blocks together in different ways to make interesting and fun donation quilts. If you want the full, official minutes of the meeting, check the BAMaQG blog. This will just be some impressions of things I liked or inspired me. 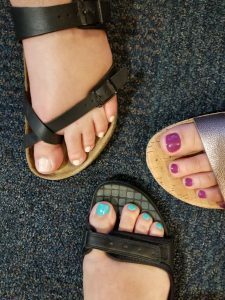 Three of us were chatting and admiring each other’s pedicures. I took a picture and posted a photo/joke up on IG about the latest BAM challenge. I wasn’t 100% joking though I don’t know if I have time to make something. We’ll see what people say. 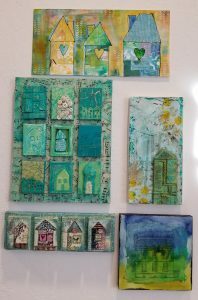 I was invited to do a trunk show next month. Gerre had spoken to me about it several months ago and I had completely forgotten, so I was a little stunned when she announced it. Of course, I am extremely flattered. Since the meeting, I have been thinking about which quilts to bring. I can’t bring them all, because I don’t have them all. Also, there are too many even of the ones I still own. 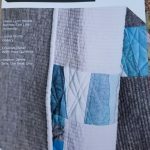 I am going to focus on my older quilts. I haven’t, for the most part, showed them at guild and I think they will be the most interesting. In preparation for this exercise, I am preparing some Throwback Thursday posts. Look for those. Gerre is starting to talk about projects that can be made out of all of our merit hexies. 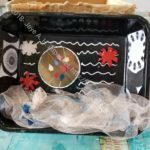 She has started to collect ideas on a Pinterest board and there are some fun ones there. I am not sure what I will make. 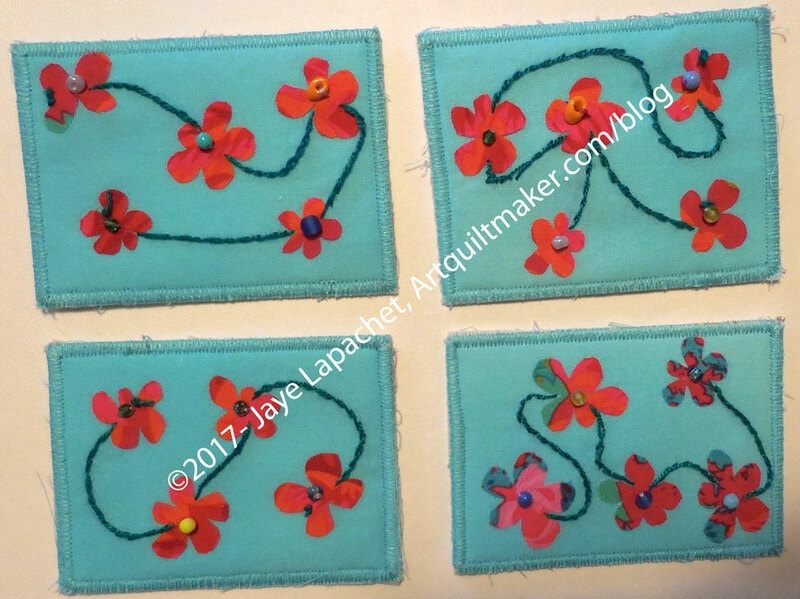 I don’t want to sew them all together like a Grandmother’s Flower Garden. I have enough EPP with the Half Hexie Star project. The Charity Girls have some interesting blocks. I have never really been interested in the Monkey Wrench block. Of course, all blocks have beauty in their own way blah blah blah. I think I must have missed the call for these blocks. I saw them laying on the table as I was wandering around and found them to be the most exciting Monkey Wrench blocks I have ever seen. I particularly liked the top one. I took pictures of it in detail in case I want to make some like it – for the charity project, of course. 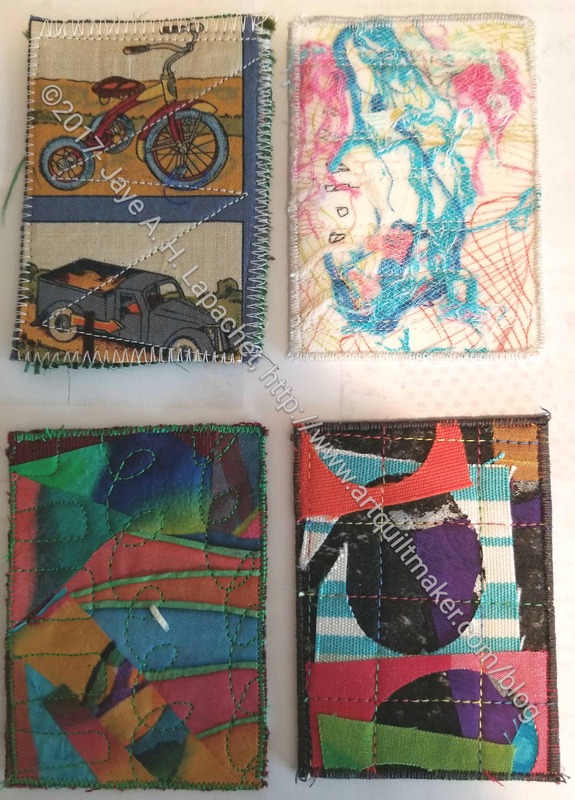 I think all of the MW blocks use fabric cleverly and that makes them much more interesting than just using two colors/fabrics. My favorite is particularly interesting, not just because of the fabric, but also because of the reversal of foreground and background. I am not an eye researcher so I don’t know the particulars of how the eye sends information to the brain, but I think that I was looking at it more. My eye was moving around the block more because of the foreground/background switch. My brain was trying to make sense of the information the eye was sending to it. I am VERY tempted to try making a few of these. 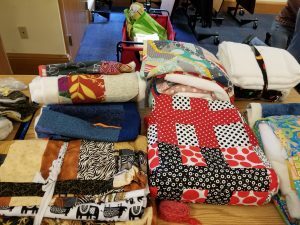 The Charity Girls still have a lot of quilts available to quilt. This makes me nervous because I always bring quilt tops. I barely quilt for myself and quilting for charity might send me over the edge. 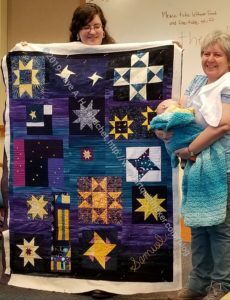 I was pleased that someone had taken the Stars #2 Quilt right away to quilt. Another thing I don’t have to worry about. Most of my info seems to be about Charity. 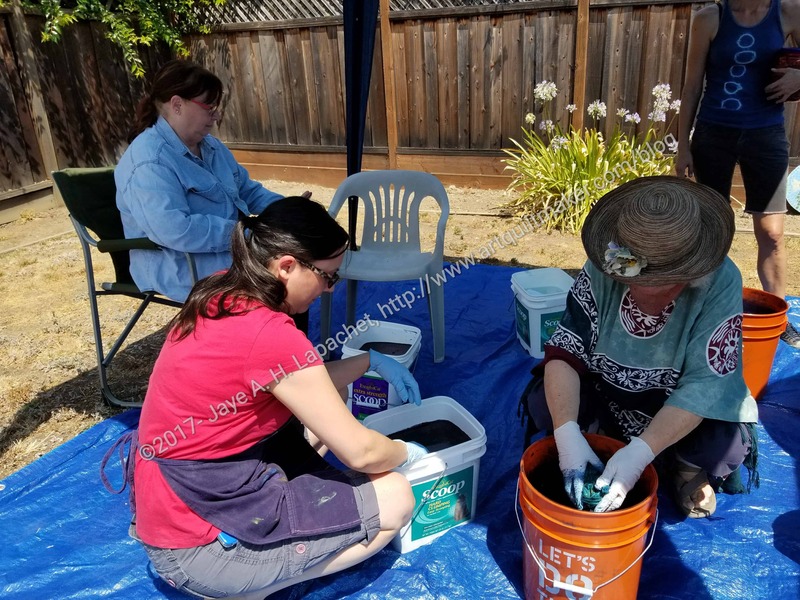 There is a lot of interesting work going on with Charity right now. A lot of people stayed until the bitter end, but not a lot of people sewed. There wasn’t a lot I could photograph, as a result. 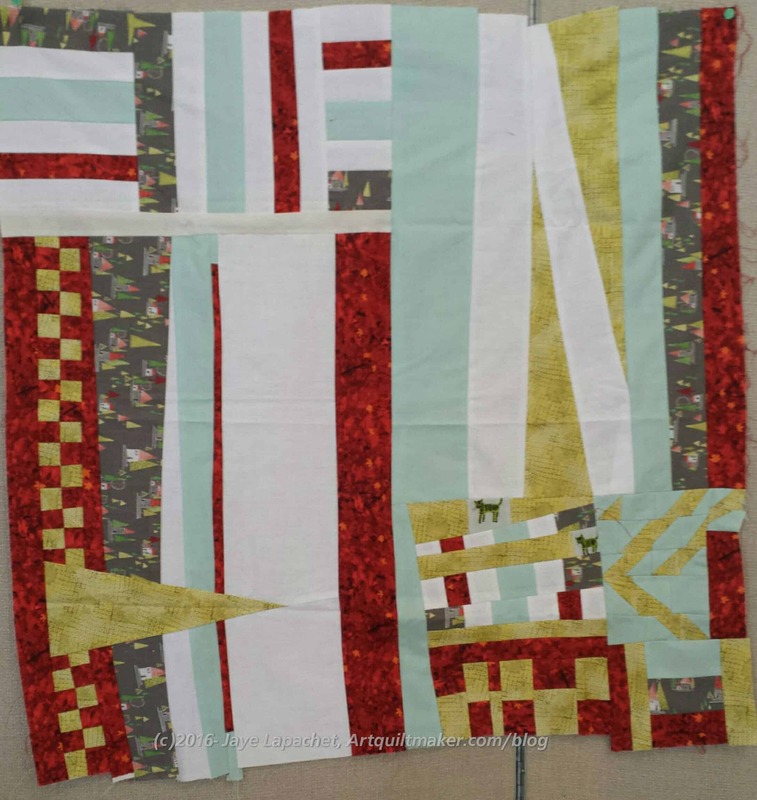 The last Charity effort I saw reminded me of my Renewed Jelly Roll Race Quilt. The colors in the fabrics are little bit dustier than my quilt, but this is still a very cheerful and attractive quilt. It was a great meeting, as usual. The Board is doing a great job. I made a second CQFA meeting in a row. It was exciting to have two weekends in row to devote to doing what I wanted. As per usual, I made ATCs for the meeting. I never quite know what design I am going to use until I do it. Often, I look in my scrap drawer to see what is available. 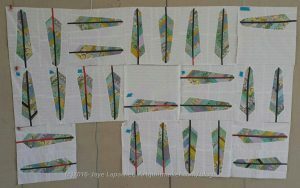 On this day, I had straightened up the scraps from some tunics I had made. 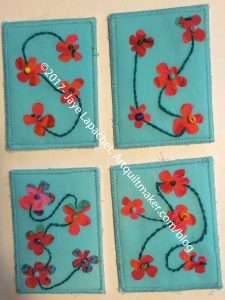 There were some large pieces of Philip Jacobs fabric available without much rummaging and I used that to make the flowers. In this case, I also wanted to use some of my new Sue Spargo Perl-type cottons and came up with this design to do so. I had some trouble getting the stitch to be smooth, but as I worked through the cards, I got the optimal length worked out. 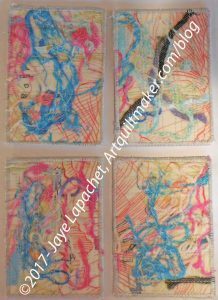 I noticed from looking at the last group of ATCs that I tend to embellish them. As in October, few people made ATCs. Bron and I were the only ones who had any to share, so we exchanged one each with each other. I made an extra one when I got home and will use these for the April meeting, assuming I can attend. 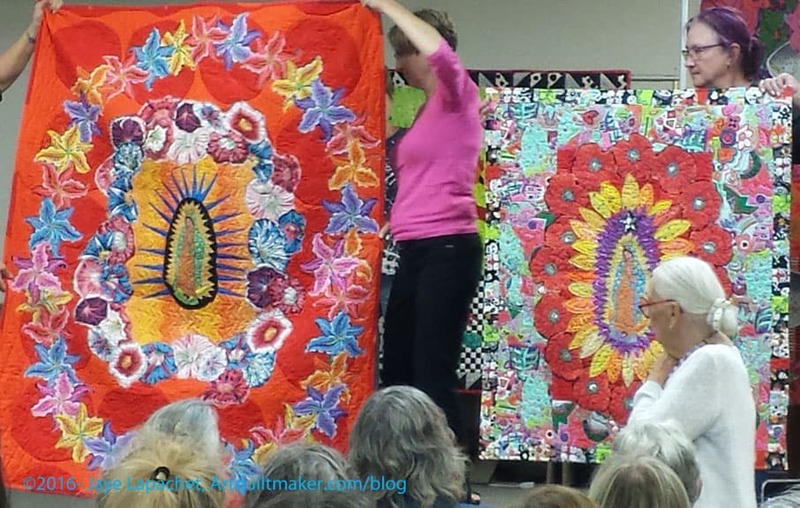 At the end of July, I went to a Freddy Moran lecture at the San Francisco Quilter’s Guild. I am not a member, but they do get good speakers, so I try and go once in a while. End of July? I know. This post has been laying around for awhile. I like Freddy’s work because it is bright and I like her work because of her collaborations with Gwen Marston. 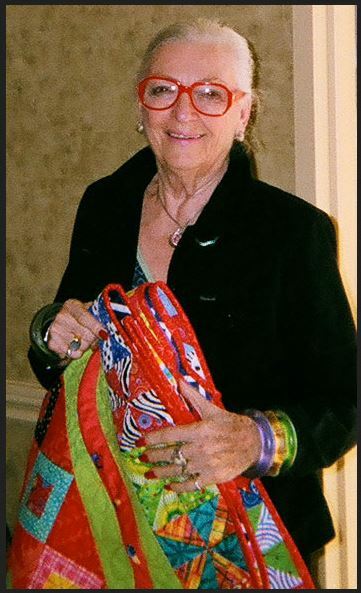 I have heard her speak a few times and have dozens of quilts from the books she has written on my “to make” list. 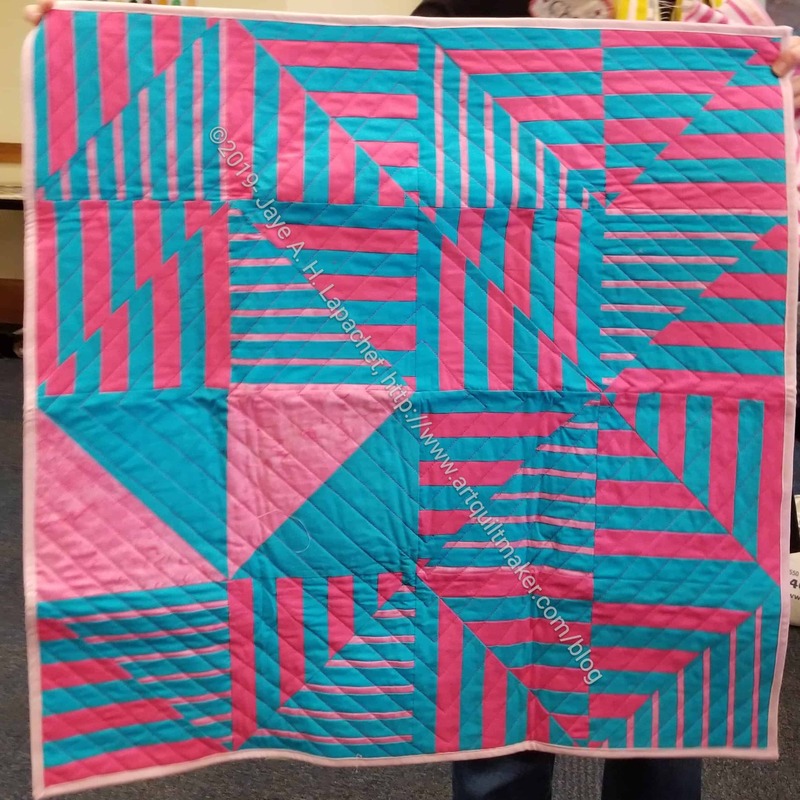 Actually, I want to make quilts as bright as hers more than I want to make the actual patterns. She inspired me to use dots and colors as neutrals. Freddy is getting quite old (approaching 90) and her husband died last year, which sent her into a tailspin. She talked about the changes in her life affecting her work and methods in the lecture. 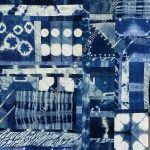 Freddy started out her quiltmaking “career” with a sampler quilt, but didn’t feel she was very good at the technical aspects of quiltmaking. She didn’t start until she was over 60 and her kids were grown, which she thought was part of the issue. At some point she made a house block and that sent her off in the direction of multiple house blocks. 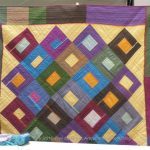 She made a number of house quilts and found that bright colors were what she liked. She doesn’t think she is particularly good at technique and now doesn’t even sew much. 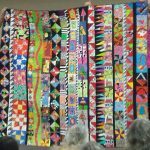 Freddy showed a number of quilts, which look different from her house quilts. I could still see the ‘Freddy touch’ when I looked at them as well as the influence of her collaboration with Gwen Marston. 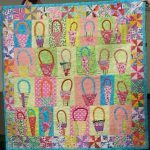 I especially like the basket quilt. I’d also love to make a row quilt like hers. 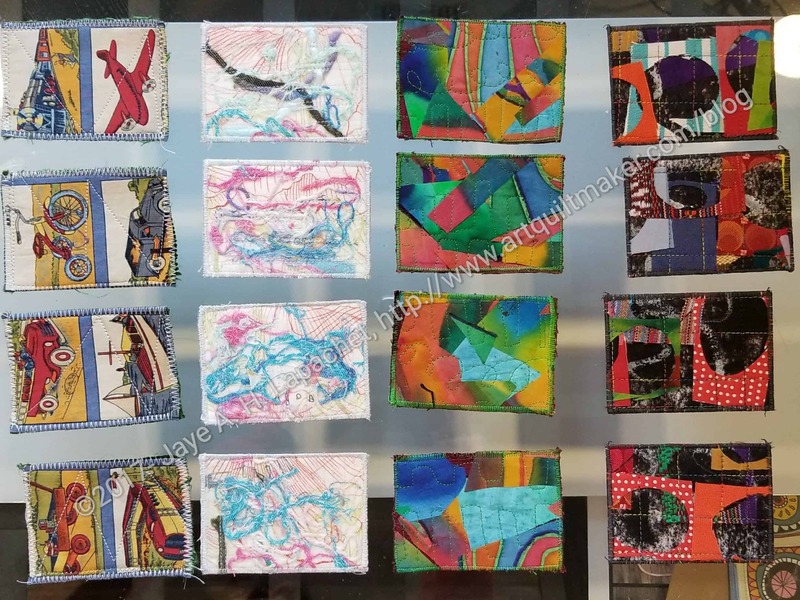 She is doing a new collaboration with her quilter now where she glue sticks fabric and motifs to a background fabric and then her quilter “appli-quilts” the pieces to the background. 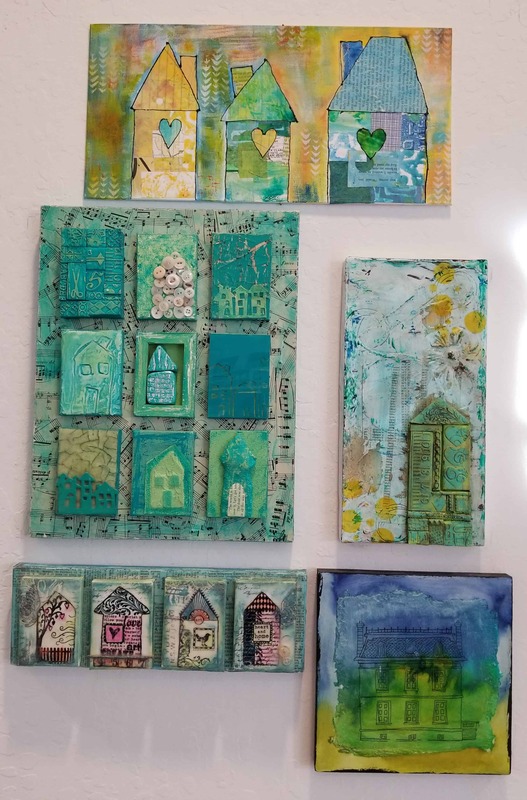 She has other new pieces which remind me of Mary Mashuta’s “Pushed Neutral” technique, which was so intriguing when I started making art quilts. I really enjoyed the lecture. 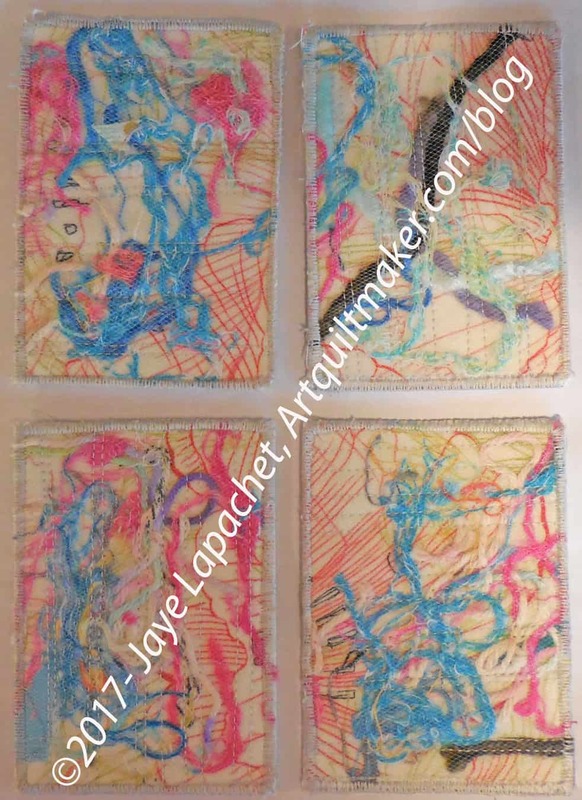 I wish I could go and spend time with the various quiltmakers I admire and see what they think of my work. Rhonda and I ducked out of the BAM Retreat to attend the CQFA meeting. They are often conflicting at the moment, which is a challenge. I didn’t want to leave the retreat, however I have missed so many CQFA meetings that I felt bad about missing another. Since Rhonda was going, I decided to go for the meeting, but not stay for the workshop. 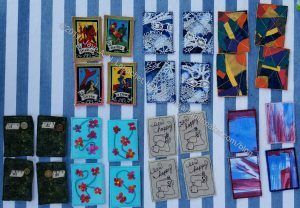 Despite my perpetual To Do List item to make ATCs, I didn’t make any. I wasn’t the only one. Poor Virginia had nobody with whom to exchange. One of the most exciting things to happen to other guild is that there will be a show either in July 2017 or in 2018. 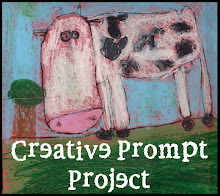 The theme will be “In Conversation.” I immediately got a flash of an idea in my mind and drew it out in my journal. It is loosely based on a picture I took in Austria. The picture is just the start. I want to add in some hands. I don’t know the angle yet, though straight on sideways or straight from the top would be easier to draw. I do like the angle shown in the picture, but I don’t know if I can do it credible justice. 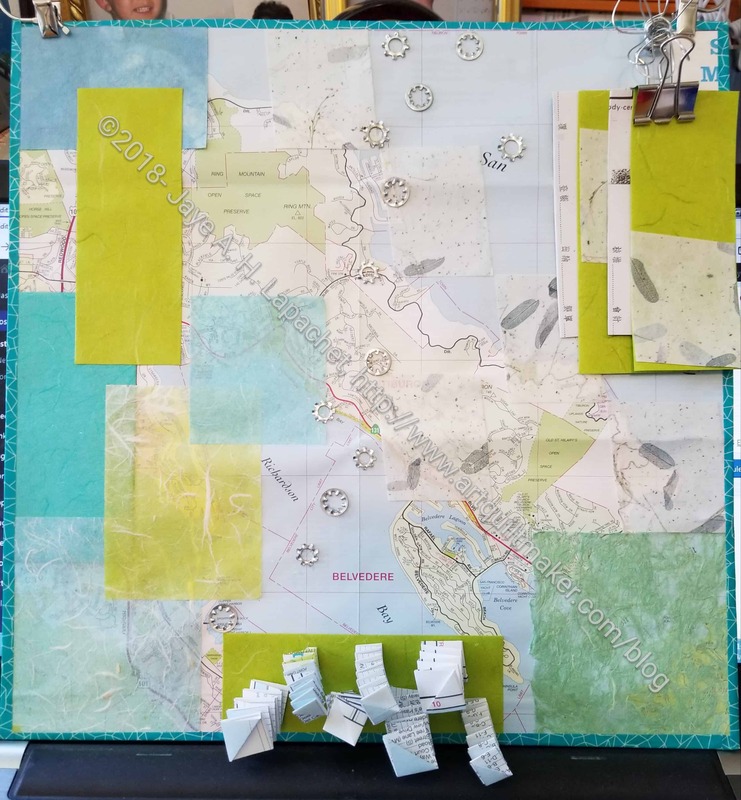 My UFO list is creeping up, but I am excited about this project and wonder if I can get started on it and get it to a good point before I lose interest? Anyway. Show and Tell was awesome. 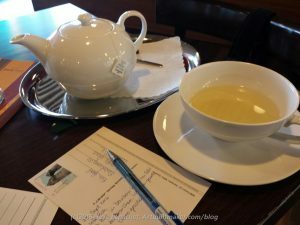 I was especially inspired by Maureen’s book. She is in a collage group that meets once a week. She has been doing some great stuff in that group. 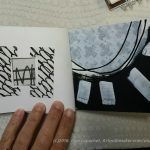 In a recent meeting, she learned about a simple Japanese binding and made a book. The content/pages are always a problem for me. 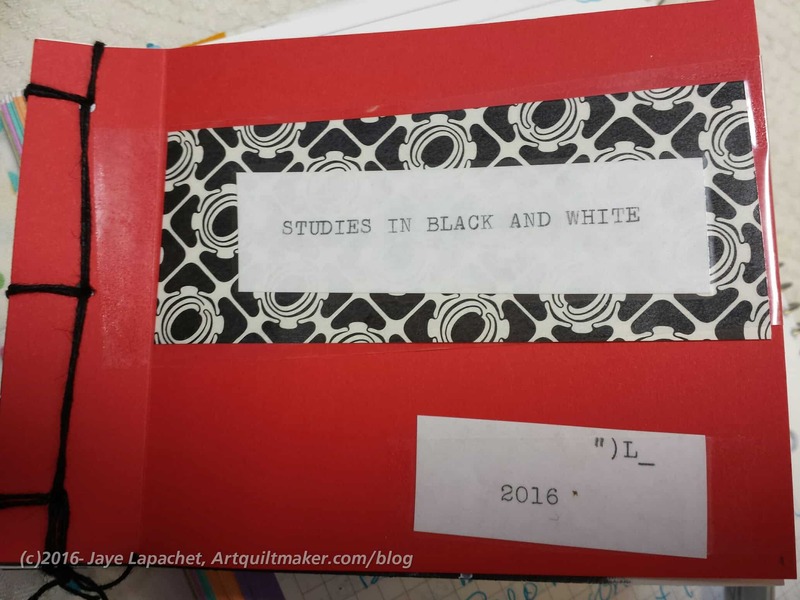 How many journals does a person need? 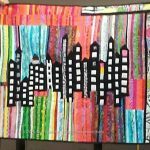 Maureen had a genius idea to use black and white drawings from a previous class. I love this book! The overall content and structure are great, but the best part is the little surprises inside. 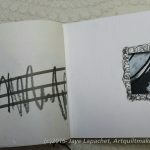 She added a window on to the next page. One of the pages has a rounded edge, again providing a glimpse farther in the book. Another page is cut at an angle and the following page is so carefully placed that the reader cannot tell they are two separate pages right away. Julie brought her Tumbler quilt. 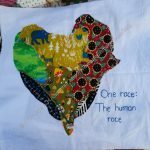 Dolores showed an almost finished fabric sculpture. She has been working on studies to get the process down for awhile. I have seen the smaller ones, but was thrilled to see the large version. 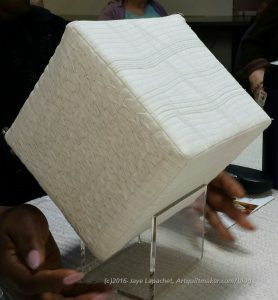 Each side has a different texture. 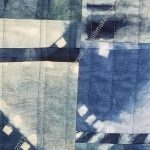 Some of them are achieved through quilting, but others are kind of sewing techniques such as smocking. 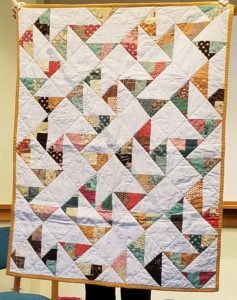 I love the textures she achieved, especially from some serious quilting on the sides. 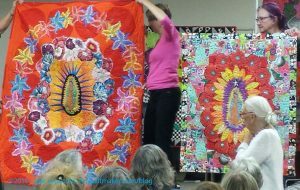 Carol is still working in solids and brought two of her quilts. 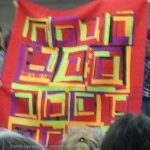 These are a follow up to the quilt she worked on at the Retreat. 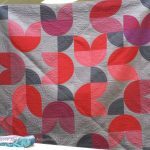 I really like the subtle shifts in color in the Tulip quilt. I know that there are depths that tone-on-tones achieve that solids can’t, however I can’t help but love what people can achieve with solids as well. 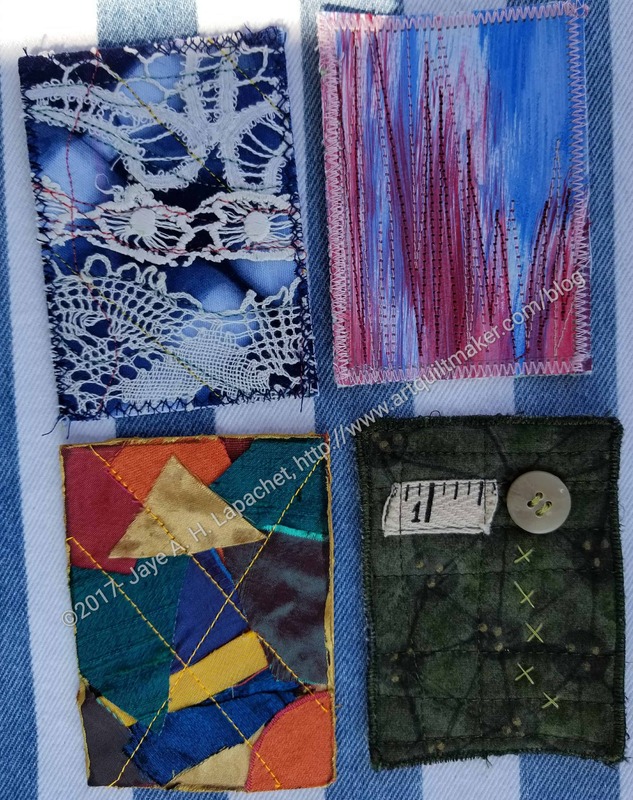 Jennifer brought more of her felted wool pieces. 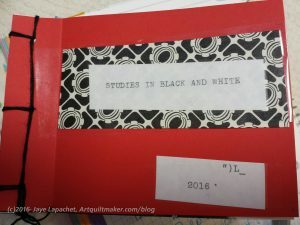 Nancy brought a journal cover she made using my tutorial. I was pretty excited about that, because someone actually used one of my tutorials! Virginia brought some placemats. Reva made a 3D owl. The list goes on and one. 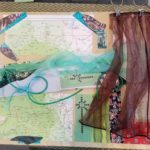 I am always so inspired by the ladies who create and share at CQFA. 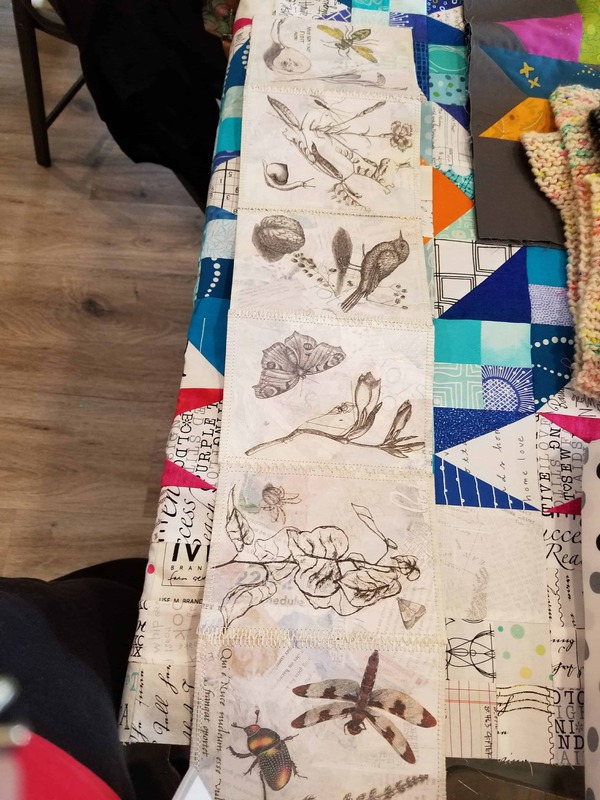 Recently we started having Craft Night again.I am not sure when we stopped, but I know that I was able to finish my Sampler because I took it to Craft Night. Life became too busy with little kids around. This time the attendees consist of my two SILs and me. Almost all of our kids are out of the house. One left Tuesday for college, three are out on their own with jobs, families, etc and my YM is back at school and out of my hair until Thanksgiving. 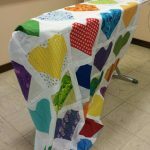 (I say that in a loving way) We alternate houses and mostly do crafts rather than quilting, though all of my projects are quilt related — or fabric related, I guess. The other week the SILs made cushions for SIL #3’s couch. SIL #2 has a lot of fabric so they used fabric she had on hand. SIL #2 had all of the supplies on hand including pillow forms and by the end of the night SIL #3, who did the work, had two new cushions. 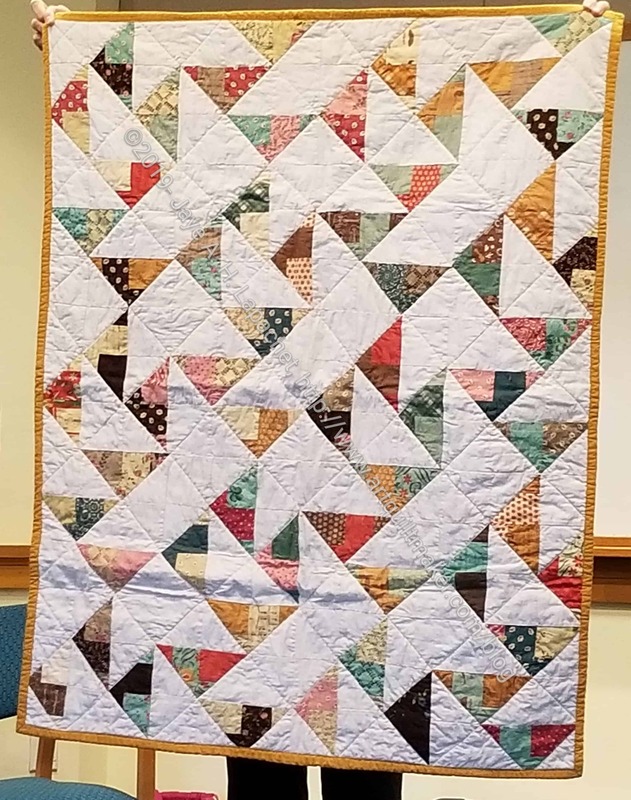 I have been able to cut up Triangle Technique pieces, finish Red, work on Under the Sea and do other handwork. It is sometimes a crush to get there, but I am getting a lot done and having fun catching up with the SILs. 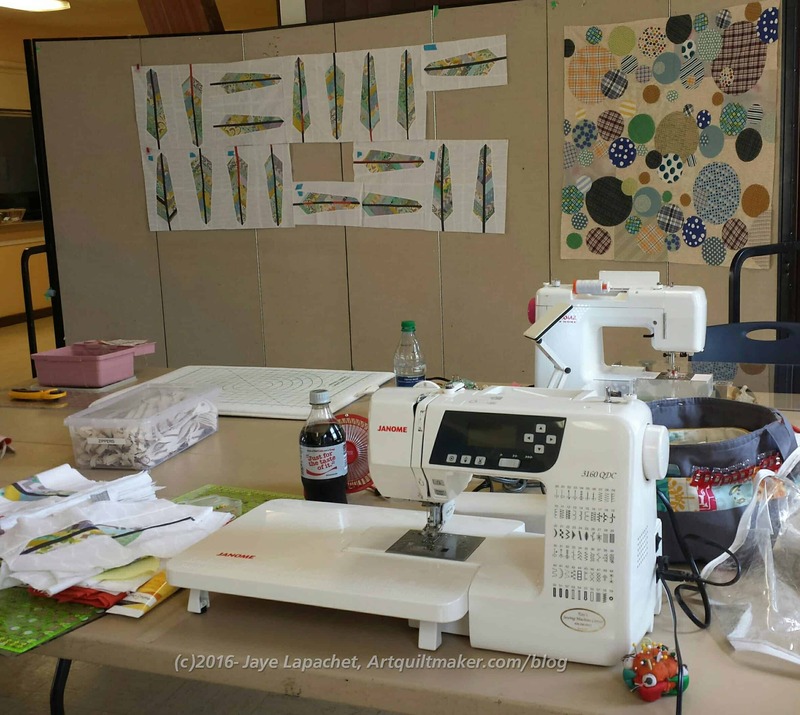 I had a great time at the Sew Day yesterday and really got a lot done! I decided that I would work on projects that were hanging around. 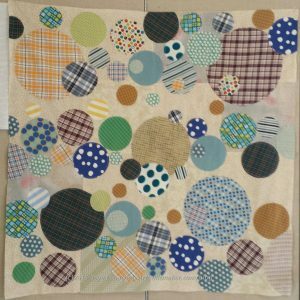 First up was the Circles Charity Quilt. 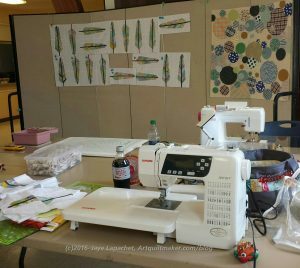 Gerre and I started working on it at the May Sew Day. MAY!!! I can’t believe it has been 4 months. I had worked on it a few times after Gerre gave it to me, but it was hanging around not getting done, so I decided I would work on that even if it took me all day. It turned out that I only had a little more to do. 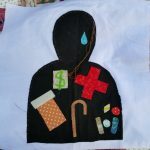 I had about 6 circles to applique’, tying off threads and trimming. It didn’t take me very long at all. 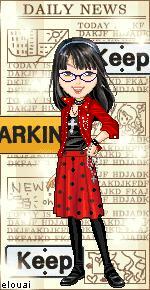 I pressed it and gave it back to Gerre who will quilt it or give it to the guild to quilt. I am really pleased with how it turned out. My “reward” was to work on the Petrillo bag that I cut about 15 years ago. Not really, I cut it out, maybe, a year and half ago. It has been on my to do list forever and it was time to sew it, so I started. I don’t know why I waited because the bag started to look like a bag before I left. I was short some supplies, so I skipped a couple of steps, but did as much as I could in the time I had and really made some progress. I am really kicking myself or not getting to this bag sooner and having it take up space in one of my Chubby Charmers. 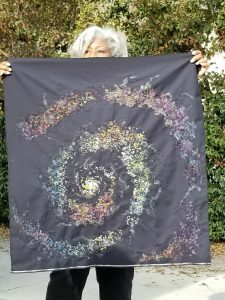 Angela basted one of the Pulse quilts the guild made. She is getting ready to quilt it. She was a rock star. She just got on with it and pretty soon the whole quilt was basted. 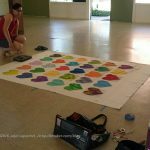 I knew she would be working on it so I checked the Orlando Modern Quilt Guild website to see how they were progressing. They are really making progress. The creativity used in creating the layouts is wonderful. 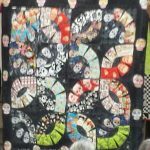 They have a lot of quilts completed and more in progress. I am so glad I was able to contribute. Mary worked on the Improv Round Robin project. She had Lizzie’s piece. Susan worked on her Cargo Duffle and was able to finish that. 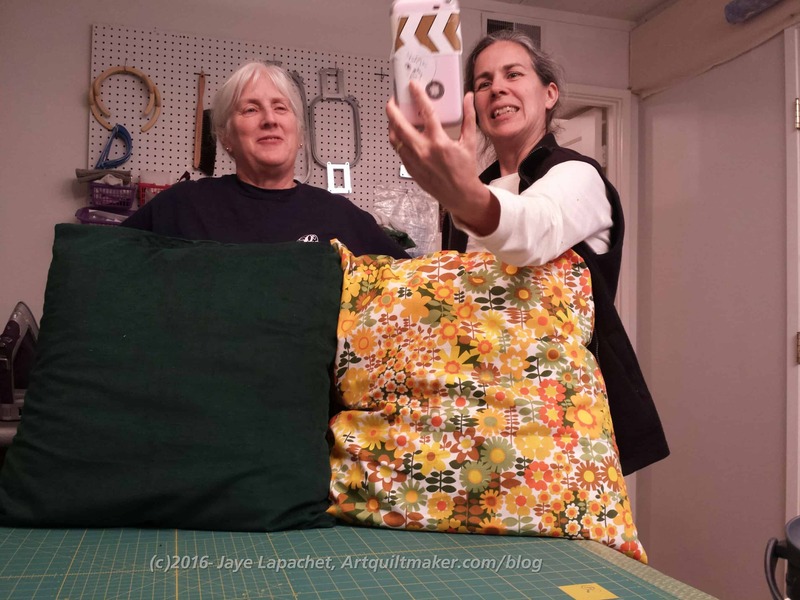 Patti was sewing doll clothes for her granddaughters. Karen was working on another quilt in her series of art quilts related to Black Lives Matter. Gerre pulled out some AMH feather blocks and was putting them together. She is pretty close as all the blocks are done and just has to finish sewing the rows. 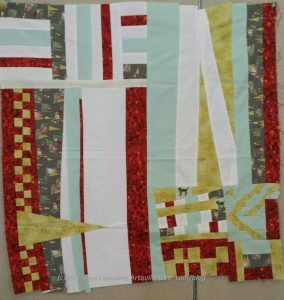 This is one of her earlier quilts and I love it. 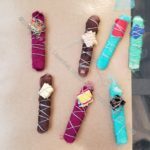 One fun thing is that we talked about sewing – tips, tricks, techniques, hacks. Someone is thinking of making Sew Together Bags, so we discussed making them just as functional, but a bit easier. All in all, it was a great day and I really enjoyed myself.